Most of us grew up hearing legends of the direct connection that our diet had on our bodies. Of course, we understand what they meant… that whole input and output connection that basically tells us that we can’t eat as much apple pie as we want. Hogwash! But, that’s not what we thought it meant! “You are what you eat” somehow meant that if we dared to eat that strange green and slimy ball of brussel sprouts that our skin would turn green and we’d smell just as terrible as they did. Not that we looked forward to turning into a giant slice of apple pie, either, but it was certainly a better option! Thus it comes that Halloween is a particularly exciting event. Not only are kids ready to run out and gather up a wild assortment of delicious treats, but the transformative options are significantly more attractive. Suddenly the chats about which kinds of candy that the kiddos will acquire on their streetside wanderings are not only a bet on what they most hope to be able to eat, but what might be the best look! 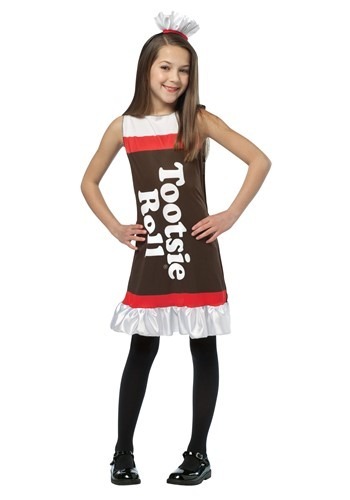 Win both this year with this Girl’s Tootsie Roll Dress. Sweet treats are what every little kid is dreaming about on the 30th and none can deny the simple joy that comes from the tiny cut of sweet chocolate that is the Tootsie Roll. The chewy candies make for a perfect image in this tank-style sleeveless pullover dress with the famous logo printed across the front. The ruffled bottom and matching headband make a perfect look of the wrapper ties. This delightful dress will make you want to eat up your little lass as well, though we’re pretty sure you won’t actually mix her up with her gathered candies!